I am slowly learning where to find the best thrifted treasures in town. I've scoured 2 local Goodwill stores, two church charity shops, the Humane Society shop, and my local antique mall. Goodwill is usually hit-or-miss. The antique mall is more pricey, but I can often get some good deals in the "junkier" booths. My favorites, by far, are the church charity shops. These shops are usually well organized and have great prices. They are typically run by volunteers, therefore don't have to pay workers and can keep their prices low. I found all of this week's treasures at Goodwill for a grand total of $9.50! Home-Made Tool Caddy ~ $4.99 This thing is heavy! Solid wood, it likely lived in someone's garage for many years. It looks well-used. I love it! Green Ceramic Planter ~ regular $2.99, on sale 50% I am working on a collection of this type of green pottery. I'm not particular about it being McCoy, I just like the color. 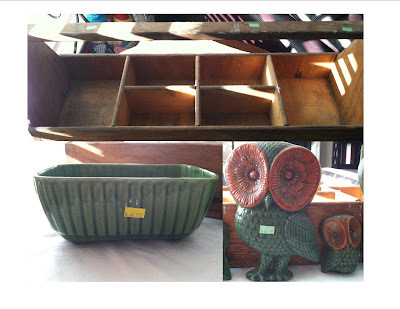 Similar items in the antique mall sell for $15 and up. Vintage Owl Family ~ 2 large @ 99¢ each, 2 small @ 49¢ each = $3 total These cute little guys are lighweight plastic wall hangings. I plan to use them in my back porch makeover, along with those green planters mentioned above. That's my haul for this week! I'm linking this post up over at Simple Design's Share Your Thrift Haul. Happy Thrifting, y'all. Oh love that tool box - such potential!